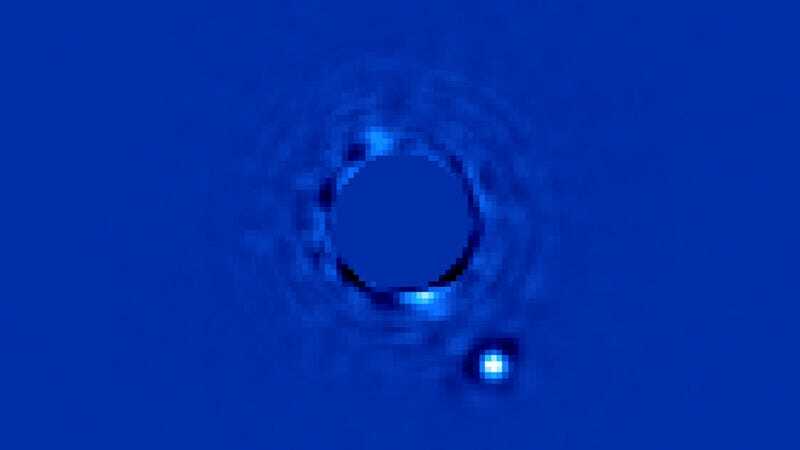 After 10 years of painstaking development, the Gemini Planet Imager has returned its first image of a distant exoplanet. Behold Beta Pictoris b, a massive planet several times larger than Jupiter — and over 63 light-years from Earth. It's almost impossible to think that we could snap a pic like this of a planet so unbelievably far away. The Beta Pictoris system is 6x1014 km away, or 372.7 trillion miles. Compounding the challenge is the fact that the planet is considerably fainter than the parent star, which resides nearby; astronomers have to separate the planet's light from the glare of the star. To to do it, the Gemini Planet Imager (GPI), an instrument at the 8-meter Gemini South telescope in Chile, uses a number of advanced tools, including sophisticated adaptive optics to remove the blurring effects of the Earth's atmosphere, a coronagraph that removes starlight so planets can be seen, an infrared sensor, and a spectrograph. The near-infrared image above shows the planet glowing in infrared light from the heat released in its formation some 10 million years ago. The bright star, Beta Pictoris, is hidden behind a mask in the center of the image. The visualization still contains a few scattered starlight artifacts, called speckles, but they're vastly fewer than in previous images. Image credit: Processing by Marshall Perrin, Space Telescope Science Institute. Image credit: Processing by Marshall Perrin, Space Telescope Science Institute and Franck Marchis SETI Institute. Amazingly, this is just a tease of what GPI can do. "Seeing a planet close to a star after just one minute, was a thrill, and we saw this on only the first week after the instrument was put on the telescope!" declared Gemini staff scientist Fredrik Rantakyro. "Imagine what it will be able to do once we tweak and completely tune its performance." The images were released today at the 223rd meeting — yes you read that correctly — of the American Astronomical Society in Washington. You can find out more about the amazing new GPI at the Gemini Observatory. Top image credit: Gemini/Christian Marois, NRC Canada.